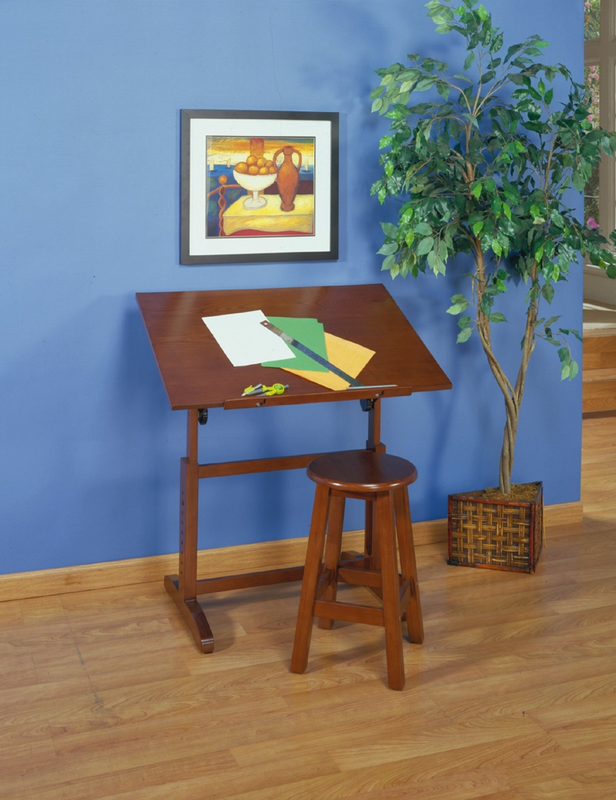 No longer is space a problem with this folding table that allows for a quick and easy work surface when inspiration comes while folding away when not in use. The Studio Designs Creative Table is the original classic design of the Studio RTA folding art table built as a sturdy piece of furniture that will last for generations. The thick table top combined with structurally designed legs guarantee the perfect place to conduct your art projects. If space is a concern, it folds to store out of the way when you aren't using it with the simplicity of two adjustment knobs for the upper angle. The table top measures 36 inches by 24-1/4 inches and stands at an adjustable height of 24-1/2 inches to 35-1/2 inches. 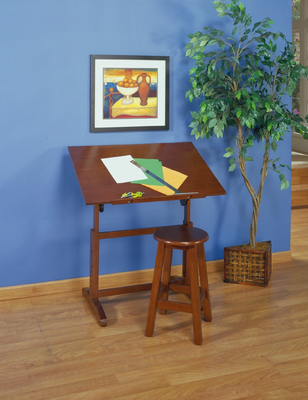 It features solid wood construction with adjustable levelers and includes a drop down pencil ledge. A 22 inch tall matching stool comes with the table. Please note that this item has a modest oversized shipping fee of $39.95. 4.5 out of 5, Based on 4 Reviews. I love this table! I have a small space and this fits perfectly. It was easy to put together. The table is just what I wanted. I did not really need a large drafting table. It's a perfect match for the rest of the room, and very sturdy nice of furniture. I ordered this table because I was looking for a small table, made of wood, that could be set quite low. I was not interested in the stool and wish they had not come together. The table is sturdy and seems very well designed. It is just what I wanted. This is a pretty good little table. The wood is very sturdy, and the design is simple, which is exactly what I wanted. My only complaint is that the screws they included were kind of flimsy; the desk itself if nice though, as is the stool. Just use your own screws and you are good to go.